Some of the advancements occurred on exciting finishes as the Bulldogs wowed and played to the loud sizeable crowd that followed them to Billings. Bozeman boosters tried to answer the Butte High contingent’s chants of “Butte! Butte! Butte!” with emissions of “Beat Butte! 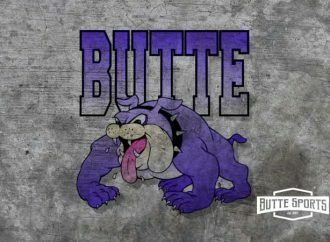 Butte! 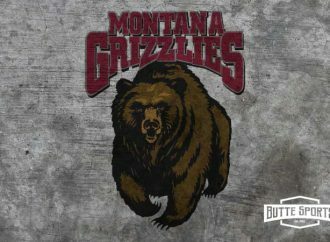 Butte!” as the competitive scene took shape on The Metra floor — and in the stands. Bozeman shot to the top of the Class AA team scores with 132 points through the quarterfinals and two rounds of wrestlebacks. Great Falls High stood in second place with 102 ½, Billings Senior third with 97, Missoula Big Sky fourth with 94 and Butte High fifth with 83. Two-time defending champion Kalispell Flathead scored 63 points and was in seventh place, after Billings West’s sixth place total of 69. The semifinals and next round of consolation will begin at 9:30 a.m. on The Metra floor with Bulldog semifinalists being sophomore Keagan Gransbery at 103 pounds, senior Wil Queer at 113, senior Carl Anderson at 160, senior Kole McGrath at 182 and junior Kameron Moreno at 185. 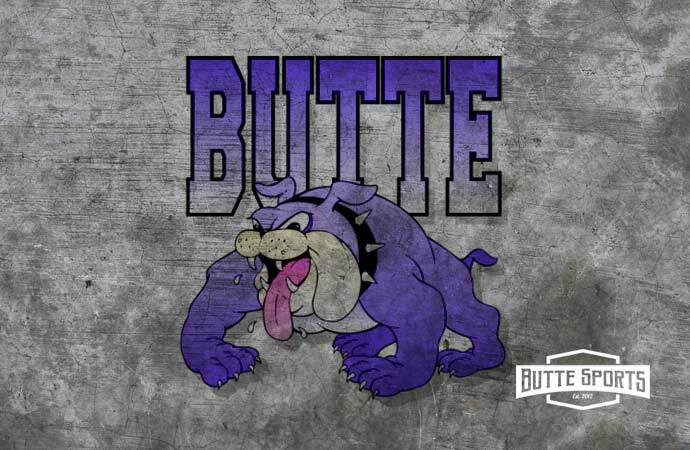 Also in the run for place-winnings for Butte High are junior Christian Sherman at 103, junior Scout Allen at 126, junior Quinn Sullivan at 170 and senior Kyle Harding in the 285-pound limit class. “It’s a great group,” Johnston said. Queer and McGrath helped to raise the intensity level with their semifinal bouts. 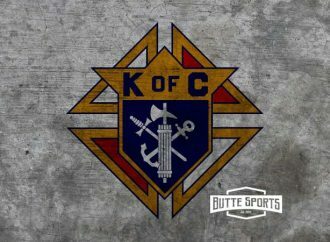 Queer scored a 4-minute, 37-second pin over the Western Division’s top seed, Codry Frost of Kalispell Glacier, in the quarterfinals. Queer started off the bout with takedown and three-point near-fall for a quick 5-0 lead, then built it to 7-0 before nailing down the pin. McGrath registered a quick 49-second pin in the opening round, but trailed quarterfinal-round opponent Wyatt Shinn of Missoula Big Sky 5-4 with 5 seconds left in the match. McGrath, not seeming to be feeling desperation in a desperate moment, unleashed a head-and-arm move for a takedown and three-point near-fall in the last four seconds and 9-5 victory. Gransbery’s quarterfinal-round win was an 8-7 edging of teammate Christian Sherman, who capped an exciting finish of his own in his next bout, a staying-alive consolation round contest. Anderson was dominant in both of his matches as he worked to improve on the third-place finish he accomplished at State last year. Anderson pinned Rory McLaverty of Missoula Sentinel in 2:29, then won by 1:50 fall against Flathead’s Zaybin Stewart. Nobody’s been able to prevent Moreno’s double-leg takedown, so far. He used the lightning-quick tackle to take both Josh Gunter of Sentinel and Sebastian Koch of Flathead to the mat for staplings in 42 seconds and 4:21, respectively. Moreno was a sixth-place finisher last year. Sherman was in danger of losing to Billings Senior’s Holden Howe in loser-out competition after the quarterfinals, but got away for an escape point and the narrow win to remain in the field. 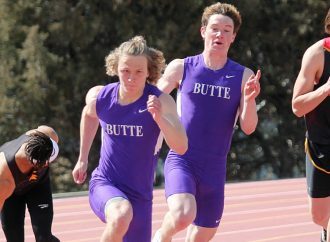 Johnston pointed to his efforts, along with that of Harding as being among important performances outside the winners’ bracket for the Butte High team. Sherman, Harding, Sullivan and Allen are all one win away from securing a state place-winning. The five Bulldog semifinalists are guaranteed spots on the awards stand. Harding won a 4-0 decision in the first round with all points scored in the third period, including a takedown and escape against Michael Downing of Flathead. Harding lost to Bozeman standout Tom Walkup on a pin in the quarterfinals, then bounced back to outbattle Zac Evans of Helena High. Evans had ousted Butte High’s Ty Raiha in the earlier wrestlebacks. Harding avenged the Bulldog loss with a 2:21 pin. The quarterfinal losses Allen and Sullivan suffered were both to defending state champions — Sullivan on a pin by Billings West’s Jace Rhodes, and Allen on a 6-0 decision to Bozeman’s Sterling Quinn. The two Bulldogs both rebounded for wrestleback wins — Allen decisioning Tyler Skinner of Great Falls High 7-4 and Sullivan on a 40-second pin against Quintin Greer, also of Great Falls High. Anthony Liva, Myles McClernan and Austin Endy each won a match to score Bulldog points before being eliminated in the consolation rounds. Christian Vetter lost on a pin to top-seeded Westerner Devin Crawford, then lost on a buzzer-beater takedown by Finn Sullivan of Flathead. Liva lost a 9-5 decision and won a 9-6 one before losing out on a fall. Shinn pinned McClernan in 1:53 before McClernan flattened Jake Slagel of Helena High in a fast 49 seconds. Quarterfinalist Paxton Boyce of Flathead then defeated McClernan. Endy reached the quarterfinals on a 3:06 pin over Tyler Little of Capital, then lost on a pin to Zane McCormich of Capital. McCormick will face Moreno in the semifinals. Endy had a lead against Justin Olson of Kalispell Glacier before falling victim to a late pin. Endy looked like he might’ve been injured on the pin application, but Johnston said no. Johnston said Harding’s ability is “showing up at the right time” and pointed to a good first round by his team and the Butte crowd support as being first-day highlights. In Class A, defending champion Sidney ran out to a big first-day lead with 140 ½ points. Fellow powerhouse Have was second with 86 ½ while Polson held down third place with 73 ½. Dillon is in 14th place with 35 ½ points and has three wrestlers in the semifinals — Noah Huffaker at 103 pounds, Luke Huffaker at 126 and Cooper Hoffman at 160. The B-C field is led by Colstrip, the reigning Class B titlist, with 115 points. Glasgow and Huntley Project were tied for second with 59 points and Columbus sat third with 68. Defending Class C champ Circle is on top of its field with 43 points while Superior/Alberton scored 19 points to tie Valier for second place. Class B-C semifinalists include Connor Johnson of Whitehall at 132 pounds, Anaconda 145-pounder Dylan Skocilich was unable to compete because of a torn labrum suffered at the Southern B-C Divisional tournament last weekend, Blake Hempstead of Copper Country Media, reported this week. The tournament will resume Saturday with 9:30 a.m. with the semifinals and the consolation quarterfinals. The consolation semifinals are scheduled for 11:30, then the consolation finals at 1:30 p.m. The Parade of Champions is due to begin at 3:15, followed by the championship round.